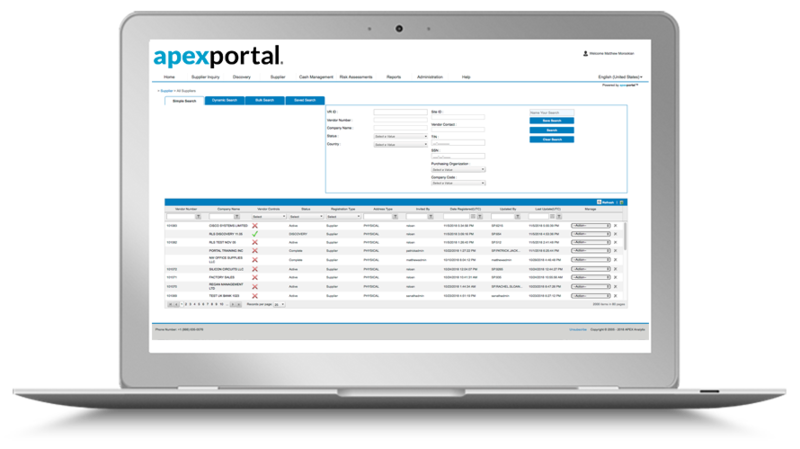 Touchless supplier management for 100% of your suppliers. The highly configurable, AI-enabled hub for your source to pay ecosystem. Built-in SmartVM data validation gives you confidence in your supplier data. Your AP is leaking. Tighten up your controls. Billions are lost annually to duplicate payments by the Forbes Global 2000. Prevent duplicate payments that ERP systems fail to catch. Unlike anything in the market, FirstStrike prevents over $2B in overpayments every year. Trusted by the world's largest companies for AP recovery audit services. Learn More. Never question your vendor master again. 650+ trusted data sources and 20M+ supplier records. Leveraging AI, robotics, and machine learning so you can know your suppliers. Accurate data to stop fraud and keep your company compliant in a constantly changing global business environment. The quality of your vendor master drives the quality of your P2P. Download our report to learn how robotics and smart technology can transform your vendor master. A lot is going on at APEX Analytix. Learn more about our products and services and what we are up to. From trade shows to volunteering, our associates get involved. Learn about APEX Archimedes, the cognitive technology integrated into our software and services that's driving smarter recoveries, better controls, cleaner data and more. The people at APEX Analytix are very dynamic. It’s a very cutting-edge company and that’s because the employees over there are always looking to make improvements and add new types of services. Look, compliance audit firms are a dime a dozen. APEX Analytix gets the uniqueness of our firm, and just as importantly the culture of Best Buy. They embrace it all...I just don't think another company could do that as well for us as APEX Analytix does. FirstStrike has revolutionized our operations. Within our first 30 days of utilizing the software, we identified enough historical overpayments to fund the full cost of the application. Your innovative prevention-based model has allowed our group to positively impact the company’s bottom line and continually provide value. APEX Analytix has transformed how we do business. The implementation of FirstStrike provides us with comprehensive controls for potential duplicate invoices and does it in a fraction of the time it previously took to review. We now have clear visibility to our AP data due to the robust reporting provided in FirstStrike, allowing us to more strategically plan our continued growth. I know I sound like a cheerleader but APEX Analytix is the whole package: their offerings are cutting edge, they are always one step ahead of us, their customer service is fantastic, they are super responsive…they are great. Many companies try to introduce their audit services to us, they are ALL greeted with the same response. We are 'partnered' with APEX Analytix and have been for many years. They exceed our expectations in regard to finding and preventing payment errors.